For courses in Introduction to Engineering and Computer Methods for Engineers. Engineering With Excel , 5th Edition introduces students to all of the functions and ways to use Microsoft’s Excel 2016 on Windows 10, the most up-to-date version of the program. 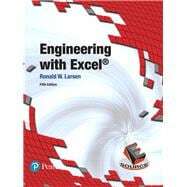 The text gives students an understanding of the many ways Excel can be used for engineering purposes. Chapters on graphing, matrix operations, linear regressions and statistics give students a foundation in computational math, while sections on using excel for finance and extending it to other computer programs helps students apply Excel to their broader lives. Finally, students will learn to write their own excel functions. Ronald W. Larsen, Ph.D., P.E., is the Department Head of the Chemical and Biological Engineering Department at Montana State University. 1.2 What’s New in Excel 2016? 11.6 What Can Be Done with a Pivot Table?